MMABeting.com studied ten major UFC events (UFC 67-77) to analyze the success of Underdogs v Favourites and found that the underdogs are cashing in at a much higher rate than the odds suggest they should. After reviewing the fight odds and results from each UFC event, we have concluded that an underdog is the better wager in main event fights as well as fights in which there is a heavy favorite (-500 or more). For the majority of UFC events, there are two major fights on the card. This is usually a heavyweight bout and a middleweight or welterweight bout. In these main bouts on each card, the underdogs went 10-11, and would have netted you $1560 in profit had you bet $100 on each fight. On the other end of the spectrum, the favorites in these fights were 11-10 and if you were to bet each of their odds to win $100 (Ex. -250 would be betting $250 to win $100. ), you would be in the hole -$2505. The second major stat we researched was the record of fighters who were favored by -500 or more. There were exactly twelve fights that had a fighter at these odds, and the -500+ fighter went 8-4 in these bouts. If you were to bet on each favorite at their odds to win $100, you would be down -$1850 from these 12 fights. The underdogs on the other hand had a great showing in these fights and went 4-8. With a 4-8 record, the underdogs would have made a $100 bettor $1020. Why should you bet underdogs? 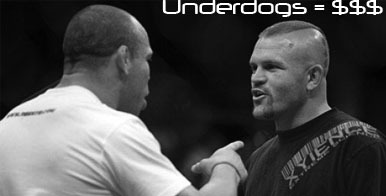 In mixed martial arts more than any other sport, the underdog really does have a fighting chance to win. Unlike football where a +700 favorite has to play a perfect game for 4 quarters, MMA always presents the opportunity for a fighter to get knocked out relatively early in the fight. MMA fighters don’t have a chance to make up for their mistakes like a football team does. In football the worst that can happen on a mistake is a touchdown. In MMA, the fight could be over. The underdogs seem to present the best value in the main bouts. Most of the public betting money is wagered on these fights, so the lines are always a little more inflated for the favorites. By consistently betting on the underdogs, you are gaining a huge edge over time. If you were to always bet on underdogs or small favorites, the monetary swings experienced will be much less than someone who always bets the favorites. When betting on favorites, you must always win your big bets, or else you’re in for a losing night. However as the stats show, the big favorites do not win at the rate they’re supposed to.